ALL children can now enjoy a new playground at Gideon Pond Elementary School in Burnsville that was installed over the summer and officially opened with a ribbon cutting ceremony on Friday, Sept. 8. 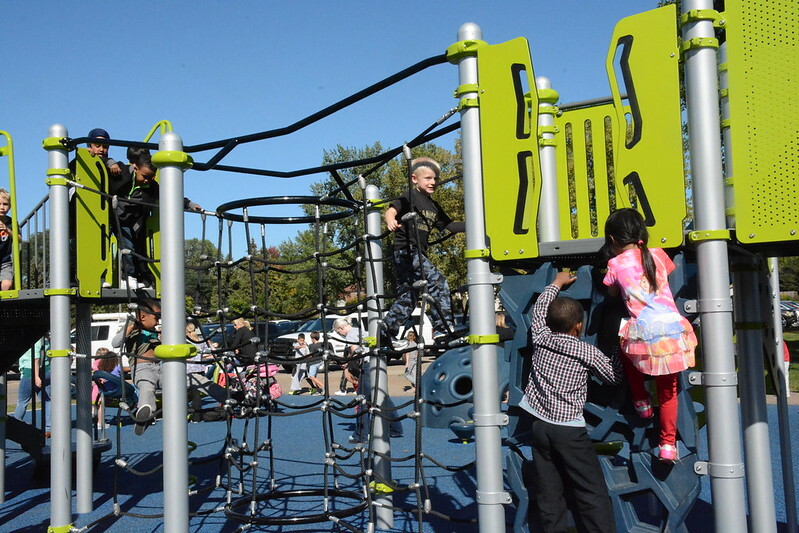 The truly inclusive and barrier-free playground is the first of its kind in Burnsville-Eagan-Savage School District 191 and the City of Burnsville. It includes pieces that are easily accessible and safe for students of all ability levels. Fundraising for an accessible playground, which has been going on for a couple of years, got big boost last spring with a $50,000 donation from U.S. Bank and the Minnesota Vikings. The organizations are awarding grants to projects that create or renovate parks, playgrounds and sports facilities in Minnesota communities. Students, parents and staff members had an outdoor celebration on the last day of school on June 8 as the check was delivered. Representatives of U.S. Bank and the Minnesota Vikings mascot Viktor were special guests at the event. Other donors include the Gideon Pond Parent/Teacher Organization (PTO), the Burnsville Lions Club, Intermediate District 917 and individuals. District 191 funds have also been used.